As a lifelong techie, I sometimes struggle explaining computer science concepts to people who are just beginning to work with code. It is challenging to break concepts down into meaningful chunks that a new learner can understand. 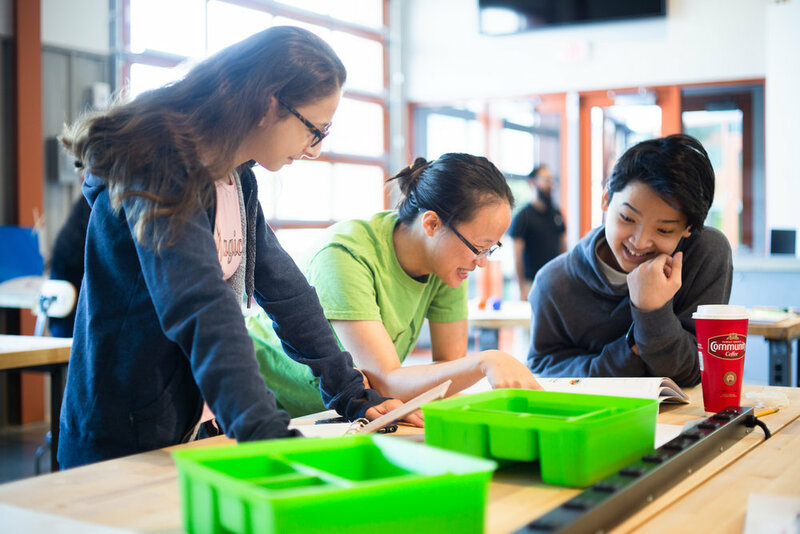 Amanda Shih and Wanjun Zhang, founders of Code Park, have taken teaching the technical arts to the next level with their course, Invent to Learn, a program for teenagers to learn about technology, programming, and more. Contextualized Learning. Experience concepts in the here and now instead of the cerebral abstract. Teach programing variables by making a flower or an LED light up. Teach design by 3D printing an object. Learn by doing. Teach by showing. Multitudinous Pathways. Everyone learns differently, and the teacher adapts to the student by employing a variety of explanations and examples to demonstrate a concept. Teach circuits with ones made of paper, ones with a single LED, and ones made with a single-board-computer like the Arduino at its core. Combined with some sweet hardware thanks to a grant from the Python Software Foundation, Amanda, Wanjun, and a merry cadre of Code Park volunteers had an awesome time taking our first group of students through Invent to Learn. Take a look at the course highlights below and learn more about our volunteers, our program, and our partner, Baker Ripley Fab Lab Houston. So how do you go from 0 to 1? How do you take someone from knowing little or nothing about technology to making videos, building circuits and programming computers? The first key is contextualized learning and the second is multitunious pathways for learning. In Invent to Learn, Wanjun teaches students about recognizing and using different types of LEDS for physical computing. Courtesy of Amanda Shih . July 23rd, 2018. We provide young learners in our coding classes with context based problem solving projects. The idea is that we can visualize code by programming physical objects. For instance, to teach about the computer science concept of variables, we say that the computer representation of a pixel is a numerical combination of red, green and blue color data. The computer tells the monitor how much red it is, how much green it is, and how much blue it is, at a certain location on the screen. It just so happens that we can program RGB LEDS the same way. If we want the computer or our Arduino to remember a pixel color, we make a variable to store that data. 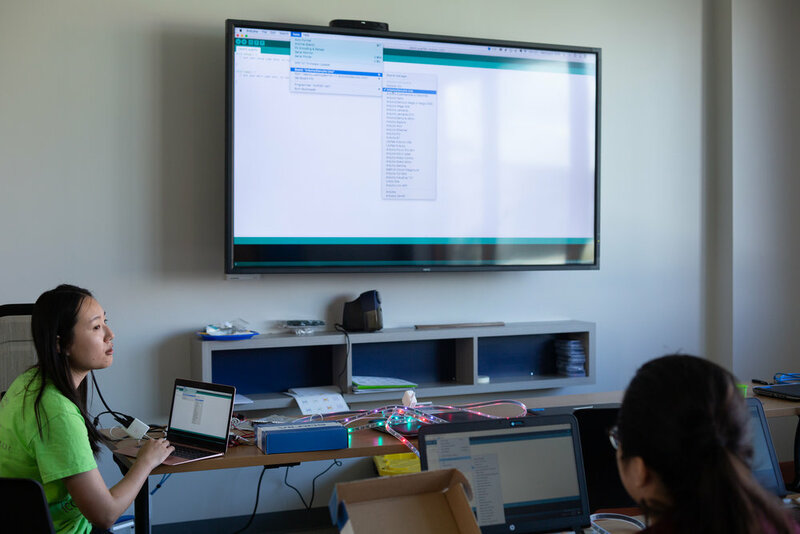 By programming lights and things with physical visual feedback, students were able to immediately see if their code did or did not work, and that quick iteration process is a different debugging experience than staring at code. Providing context like this is key to helping students understand programming concepts. Day two of Invent to Learn at Fab Lab East Aldine, students work together to program a "traffic light" sequence with a circuit they built. Courtesy of Wanjun Zhang. July 25th, 2018. The second key to teaching students is to give them multiple paths to understand a concept. To learn circuits, students first learned about basic concepts in electricity science and circuits by building paper circuits. From there, they realized that the key to using a Raspberry Pi is completing circuits, and that by programming the GPIO pins on the Pi, they were able to create an on/off switch. They then programmed and sequenced a Traffic Light project by learning prototyping skills on a breadboard, which is just another type of circuit. We used this same skill set to program an Arduino. Invent to learn taught the different skills by giving our students a variety of projects - simple paper circuits, just one LED on or off, a sequence of RGB LEDs, Raspberry Pis, and an Arduino circuit board. Amanda shares with Monica and John an entertaining data visualization from the book Dear Data during a project day at Code Park’s Invent to Learn program. Fab Lab Houston Courtesy of Wanjun Zhang. August 9th, 2018. Invent to learn did more than just LEDs and circuits. We taught students how to use sensors to collect temperature and accelerometer data as well as how to write code to log that data. Students also took the Arduino and sensors home to record data in their own environment, and then they came back with a .csv file that we charted using google spreadsheets. This helped our students learn about data science. With Fab Lab Houston we also used 3D Printers to create molds to cast soap in order to study digital fabrication. Overall, students and teachers alike had a great time learning together. In Invent to Learn, students program a circuit board to gather temperature, light, and accelerometer data at home. Amanda shows how to make sense of environment data collected with simple visualization tools on google sheets. At Fab Lab Houston. Courtesy of Wanjun Zhang. August 8th, 2018. 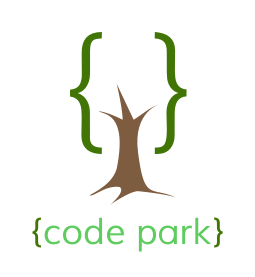 At Code Park there are many opportunities to give back to our community. I help to run our media outreach team, and we are always looking for new people to help write emails and blogs, take photos, and post to social media. Amanda and Wanjun are always looking for new volunteers to help with teaching in the classroom. Invent to Learn is in progress at Houston Community College West Houston Institute, and we’d be excited to have you join us. There are also several stretch projects we are planning, such as creating videos of us teaching classes or starting an Ed Tech Meetup for change makers who want to collaborate to inspire each other around the intersection of education and technology. Of course, if you don’t have time to give, you can also support us on Patreon by pledging to give a donation every month. Wanjun shows students how to use and set up the Arduino IDE. Students use the Arduino microcontroller to program colorful LED light patterns. At Fab Lab Houston. Courtesy of Neeraj Tandon. August 8th, 2018. Invent to Learn is open source. Check our our lesson plans on our google drive → Invent to Learn. We couldn’t have done it without support from the Python Software Foundation. Thanks PSF! Invent to Learn would not have been such a great success without our partnership with Fab Lab! We got together with Brent from Fab Lab Houston in March this year to talk about and plan Invent to Learn. We joined their Ambassadors Program which is open to the East Aldine community. The goal of the Ambassadors Program is having students engage with the space and curricula so that they will come back as “Ambassadors” and help with outreach and volunteering for other students in the East Aldine community. Our first Invent to Learn class could not have happened without our partnership with Fab Lab. Together we provided a free three-week technology and maker program for East Aldine Student Ambassadors this summer. Fab Lab Houston is part of the Fab Lab Foundation which started in MIT’s Media Lab Center for Bits and Atoms. Their MO is about empowering people with skills and connecting people on a global level. For example, if you can make something in Houston, then it can be shared and replicated at another Fab Lab anywhere, worldwide. Is your organization looking to host Invent to Learn for your students? Are you curious about partnering with Code Park to provide expertise in tech-based, maker-oriented youth coding classes Contact us below! Meet Code Park Volunteer Krishna!